Jorge Gutierrez, a Mexican animator and director who is most well-known for creating the animated series El Tigre: The Adventures of Manny Rivera for Nickelodeon is all set to make his mark on the big screen with the upcoming release of The Book of Life in October of this year. 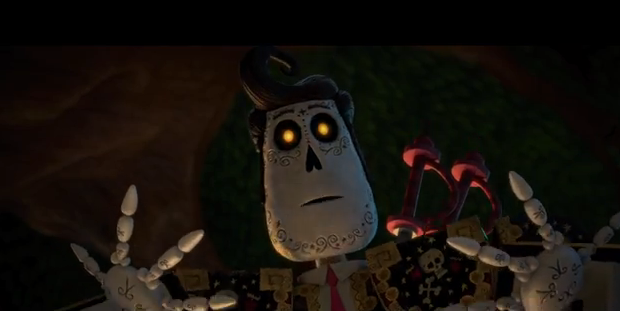 The animated comedy which was inspired by the Mexican holiday Dia de Muertos (Day of the Dead) is Gutierrez's feature film debut. He also co-wrote the film with Doug Langdale. The trailer for the film has just been released and it looks fantastic. The animation is crisp and colorful. And because the well-known director Guillermo del Toro (as producer) had a hand in it's making, it's one worth looking forward to. The Book of Life tells the story of Manolo and Joaquin, two men vying for the attention of a beautiful damsel named Maria. Lending their voices for the film are Diego Luna, Zoe Saldana, Channing Tatum, Christina Applegate, Ice Cube, Kate del Castillo, Ron Perlman, and Cheech Marin. If you are wondering about the song in the trailer, it's Do or Die by Thirty Seconds to Mars.